McALLEN — Several local families met with U.S. Border Patrol and Customs and Border Protection officials last week to discuss the current state of border wall construction in the region. These Rio Grande Valley family members, who have ties to a historical cemetery just south of San Juan, met Wednesday with Border Patrol Deputy Chief Patrol Agent Raul Ortiz and CBP officials to discuss concerns over wall construction that could threaten historical landmarks. The area discussed, the Jackson Ranch, and a place of worship that sits on its grounds is a designated historical site known as the first Spanish-speaking Methodist Church in the Rio Grande Valley. A few feet away from the chapel is the Martin Jackson cemetery, and just down the road stand the Eli Jackson and Brewster-Bravo cemeteries. A few members of Sen. Ted Cruz’s staff were also in attendance. Sylvia Ramirez, whose family owns the cemetery and land recognized by the state as a historical site, was present for the meeting and said Ortiz gave those in attendance an overview of Border Patrol and CBP’s work in the Valley. Ortiz stated that there were “no immediate” plans to break ground at the historical site. Ortiz told Ramirez and others that they have about six months to a year before there “might” be construction in the area due to delays in funding, and the planning of construction of physical barriers in the area. “… Ortiz said that cemeteries are considered ‘sensitive areas,’ and this fact would be considered as decisions are made about the future of the wall in our area,” Ramirez said. As Ramirez puts it, they were told that the meeting was an opportunity to listen, document and factor in stakeholders’ concerns when it comes time to speak with the engineers tasked with designing the walls in the areas where physical barriers would be erected. Ramirez said Ortiz noted that even if U.S. Department of Homeland Security Secretary Kirstjen Nielsen waives laws protecting historical sites to include cemeteries, CBP would still conduct studies to evaluate the archaeological, environmental and cultural impact of a border wall in the area. Ramirez said one takeaway from the meeting was that Border Patrol and CBP officials recognized that the cemetery was a sensitive area. During the meeting, Ramirez asked if the wall’s location could be moved south of the Jackson cites. They indicated that this could not be done due to existing treaties with Mexico — specifically the Hidalgo Treaty with Mexico and other considerations, like International Organization Water Rights. “One agent said that the wall needed to be constructed on the levee. Alternatively, they seemed to indicate that having a dialogue with them might have an impact on location decisions,” she said. 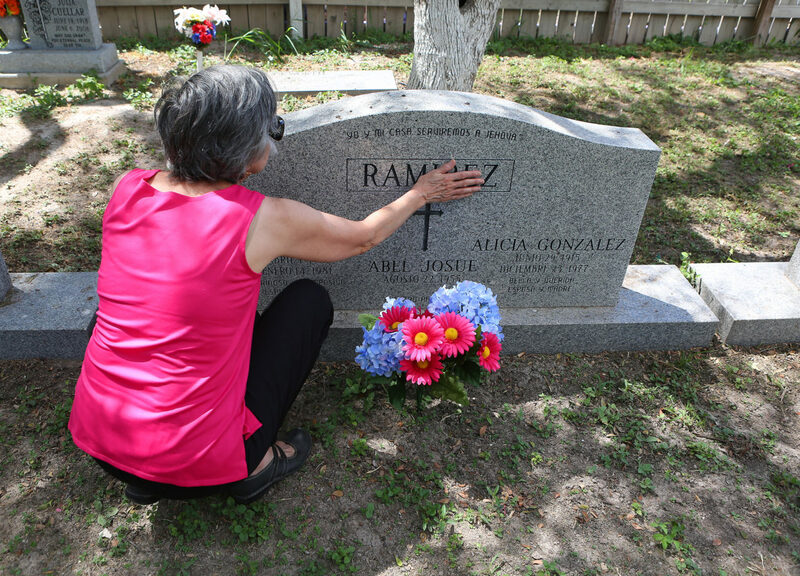 Before concluding the meeting, Ramirez said Ortiz expressed plans to visit the Jackson cemetery sites with Border Patrol RGV Sector Chief Rodolfo Karisch. Funding for some border wall construction in areas of Hidalgo County was approved in the 2018 Omnibus bill, which gave $1.6 billion for wall construction to a handful of locations — 25 miles in Hidalgo County and the 8 miles in Starr County. Rod Kise, CBP spokesman, said a request for comment regarding the aforementioned meeting was sent to CBP’s “wall team” Tuesday, but had not responded as of press time. In February, heavy equipment began clearing large swaths of land in Hidalgo County, specifically near Bentsen-Rio Grande Valley State Park and the National Butterfly Center, two “environmentally sensitive” locations in Mission included in the 2019 spending bill that are to be protected from wall construction. Ramirez, who acknowledged that the meeting did not provide any guarantees, said she felt it was important to meet with the officials. “I think it’s useful to meet face-to-face. They understand us a little better; we understand them a little better,” she said. “It’s always good to have a dialogue, and it was a good conversation. We got some information from it, made some family members feel better, because at least they know they have at least maybe about six months before any groundbreaking.